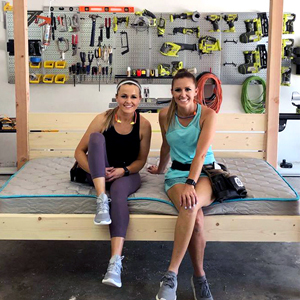 Meet sisters Ashley & Whitney from Shanty2Chic, two power tool wielding DIY queens, on a mission to create beautiful and affordable furniture, turning houses into homes. Self-described coffee enthusiasts and treasure-weavers, the two sisters transformed a hobby into a dream career. 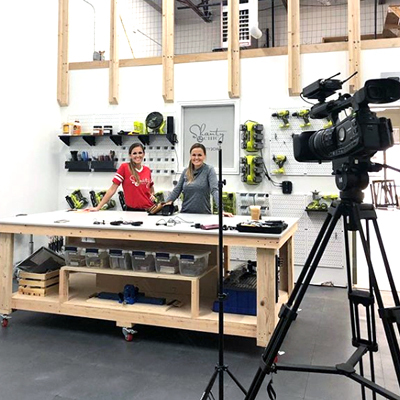 The self-taught carpenters post their journey online to inspire other people to “pick up that scary tool and go!” Hosts of HGTV’s Open Concept, and designers of the Shanty2Chic Home Collection exclusively at At Home Stores nationwide. Hey guys~ Whitney here! A little background about me and what started this whole process... I am a mommy to 5 wonderful and crazy kids and wife to Jenson. I have attempted (not always achieved) almost any craft. I have found along the way that I love, love the process of building a piece of furniture from raw wood and my power tool stash, of course. I love Jesus, my family, my tools and coffee. We built our house in 2009 and I have spent the last few years making it a home. I love to teach others and give advice on all things DIY and I love learning as well. I'm lucky to be able to share this experience with my sister Ashley! Hey guys! I'm Ashley. I'm married to my hubby, John and we have 3 kids, Kade, Tris and Tenley. We built our home in 2013 and moved into it with no furniture. Since then, I have been busy building custom furniture to fill our new home. In our new home, so far, I have built 4 beds, 3 tables, 3 coffee tables, 2 console tables, a buffet, a media storage dresser, a mantel, 3 desks, 4 nightstands and lots of shelves, wall treatments and accent pieces. I am a home body and my second home is my workshop. I love power tools, cute shoes and purses and I love designing furniture and watching it come to life in my shop. My passion is teaching and encouraging people to DIY and I am so blessed to work along side my sis, Whit! 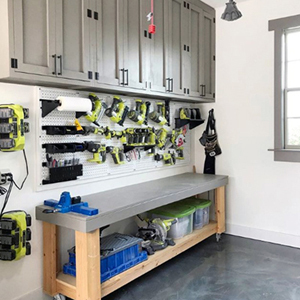 What Wall Control Pegboard System Does Shanty2Chic Use? 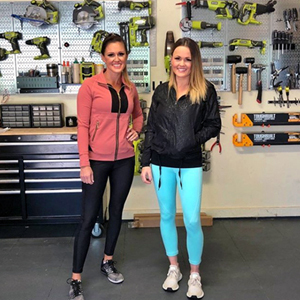 Whitney and Ashley have been great friends to Wall Control for years now so we've been through a few shop upgrades with them as they have rapidly grown their Shanty2Chic brand. Below are some of the Wall Control products the Shanty Sisters have used in their shop spaces.